It never really hits me that summer has arrived until the 4th of July. I find myself saying “I’m not ready for summer as it gets warmer and warmer… then BAM! Summer is here; full effect. 100 degree + temps, mosquitos, and outrageous electricity bills. Summer is NOT my favorite part of living in the great state of Texas but somehow I’ve survived it. Wanted to share a few of my favorite summer-time recipes. Keep Cool + Stay Happy! Add vegetables, stir well and chill for at least 4 hours. Notes: Veggies should all be chopped at roughly the same size and on the small side… you want to be able to get a variety with each bite. Also – Keeps in the fridge for about a week. I usually add the avocado one bowl at a time if I’m just making a batch to have in the fridge. Like a liquid salad, this is the perfect summer-time lunch paired with a chicken salad sandwich or bagel chips for dipping. In a separate bowl, combine dry ingredients, coconut & pecans. Use pastry cutter or two knives to cut in the butter. Should look like peas & sand when combined. Mix in one beaten egg. Mixture will be quiet gooshy. Put peaches in a 2 qt baking dish, add topping in small blobs on top. This entry was posted in Recipe and tagged dessert, fruit, gazpacho soup, healthy, homemade, low-cal, lunch, peach cobbler, recipe, soup, vegetables. Oh YOUR Grandma would be as proud of you as I am! After being in Dallas for the preparation of both of these great summer staples, you have definitely hit the proverbial nail on the head. 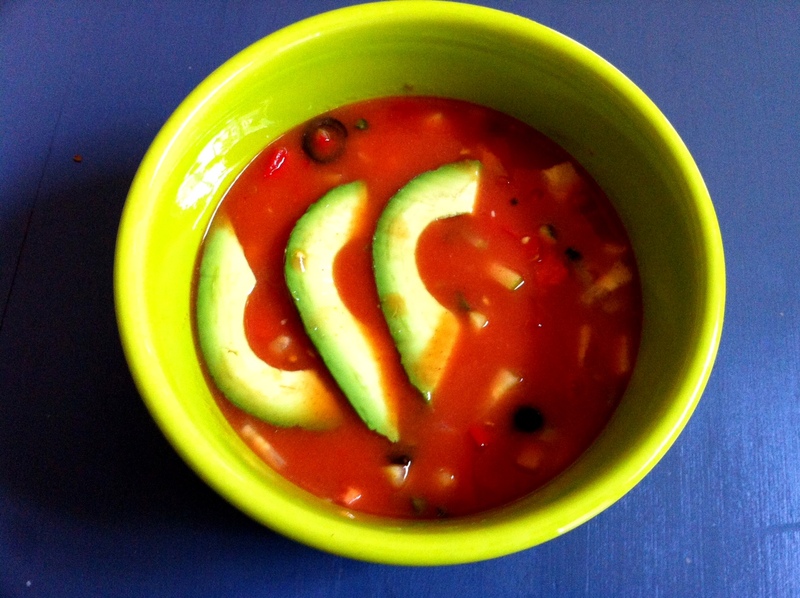 Gazpacho soup is probably new to most folks but it only takes once, and you’ll be hooked. It travels well to the picnic, beach, lake or concert in the park….easy to store in a cooler, easy to serve in plastic tumbler cups (leave the bowls for eating at home!) Also, a note for the sake of your new Tupperware, spray the inside of any plastic container with Pam prior to adding the Gazpacho and you wont have to live with the tomato-tinted plastic! 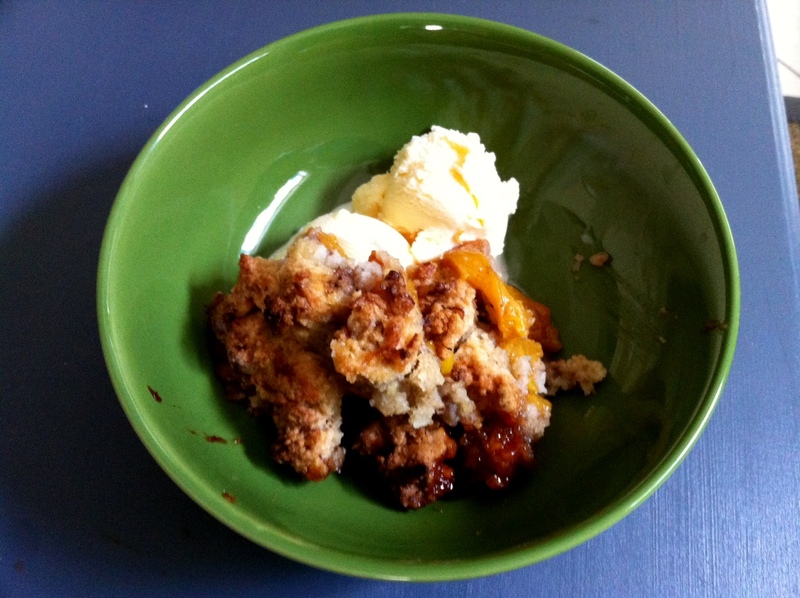 And the secret ingredient of the bit of coconut in this peach cobbler makes it just extra special. Well done my sweet daughter….you have delighted my day, my summer and my life!